The Jewish holiday of Purim is about to make its annual appearance, as it has for the last two millenia or so. But this year, it will assume special significance. For Jews who need a quick refresher, and for non-Jewish readers of this blog, here is the story of Purim, CliffsNotes style. A Persian prime minister orders the extermination of all the Jews in the kingdom. Esther, one of the king’s wives, uses her feminine charms to persuade the monarch to overturn the order. The Jews live happily ever after. Jews have been re-reading and re-hearing this story, which is recorded in the Book of Esther, every year for more than 2,000 years. So what’s special about Purim this time around? This year, a new Esther has arrived. Just like her ancient namesake, this modern Esther is quite a charmer. And like her predecessor, our contemporary Esther is desperately trying to prevent a slaughter. Who is this 21st Century version of the Purim heroine? None other than Esther the Wonder Pig. Some readers of this blog are already familiar with this special sow, and are nodding their head in agreement at this very moment. Those who have never heard of Esther the Wonder Pig may think The Beet-Eating Heeb has gone off the deep end. But let BEH quickly explain how a hog became an international celebrity — and a savior for her species. In the summer of 2012, a Toronto-area couple purchased what they were told was a miniature pig to join their two dogs and two cats. To their surprise, their new pet grew. And grew. And grew some more. She now weighs 400 pounds. This Canadian couple, Steve Jenkins and Derek Walter, had been duped. This was no miniature pig. This was the same type of pig that, if not for a mysterious twist of fate, would have been someone’s Canadian bacon, rather than a beloved pet. action to prevent the slaughter. of other people. Perhaps millions. 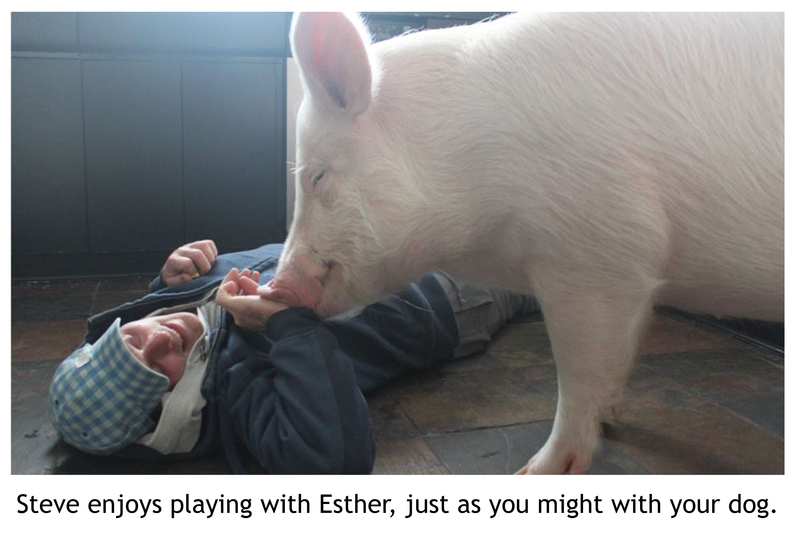 The Facebook feed of Esther the Wonder Pig might have you smiling and crying at the same time. Smiling at the photos of this friendly, affectionate pig cuddling with Steve and Derek, napping contentedly on their couch, and hanging out with the other pets. Crying at the thought that millions of pigs just like her are cruelly confined to small cages for most of their miserable lives, before they’re trucked to a slaughterhouse to have their throats slit. For years, we vegan advocates have been trying to show people that farm animals are every bit as intelligent, friendly, affectionate and personable as are dogs and cats. Steve and Derek have astutely recognized that, in Esther, they have an incredibly powerful and persuasive vehicle to drive this point home. BEH cannot help but think that the Hand of Hashem is at work here. Perhaps you can dismiss as a mere oddity that a pig who ordinarily would have been carved up into pork chops has instead landed in the home of two guys with big hearts and media savvy. In Jewish mysticism, it is believed that God can plant thoughts in your head. 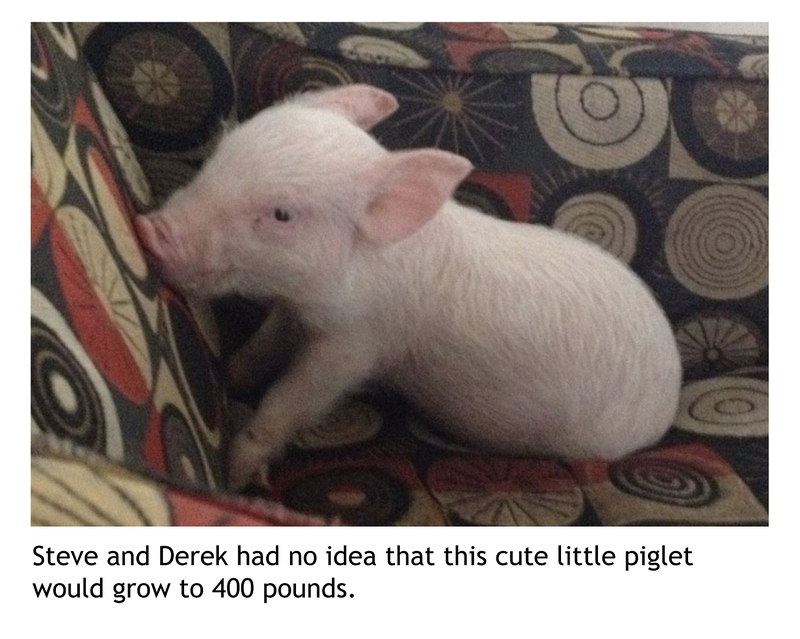 Is this what happened to Steve and Derek when they were deciding on a name for this pig? Steve told BEH that he is open to the idea of a metaphysical explanation. This much is beyond dispute: A new Esther has arrived on the scene this Purim. In her own way, she is every bit as charming as the Persian version. May she be equally effective in stopping slaughter. This is not about equating animal life with human life. But this is about preventing senseless bloodshed. 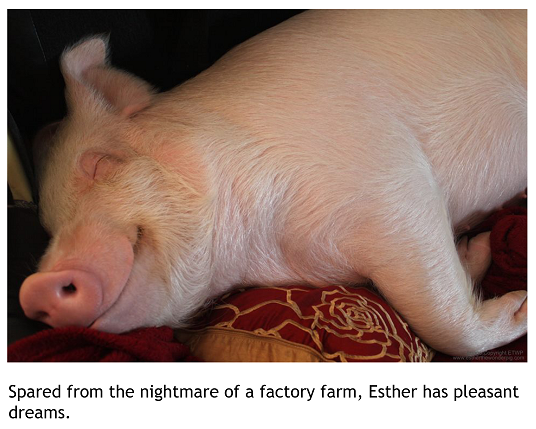 Posted on March 9, 2014, in Factory Farming / Animal Cruelty and tagged Esther, Esther the Wonder Pig, pigs, Purim. Bookmark the permalink. 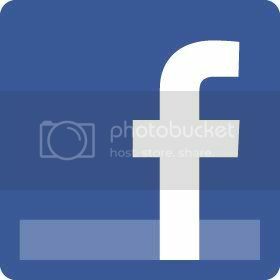 6 Comments. Wonderful article!!! Thank you for your thoughts about a very special pig indeed! Long live Queen Esther!! Kudos for an inspiring article! I printed this up and included it in my shalach manot bags! : ) Chag Sameach BEH and all! May Esther the Wonder Pig and her big-hearted parents Steve & Derek inspire millions of people toward compassion, companionship, social justice, sustainability, spirituality, and love. Beautiful! Thanks for this story. I was not aware of this story. A very wonderful post, to which I must say Amen!